Introduce the sultry and aromatic scents of our Black Magic fragrance collection to your home, and discover an evocative blend of cedar, vetiver, sandalwood, orange and clove. This complex fragrance blend has been carefully refined by our expert perfumers, before being hand-poured into pure natural wax in an elegant black glass votive. 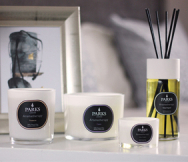 Rich, woody and warm yet fresh and invigorating, our Black Magic 1 Wick Candle marries the sweet balsam wood scent of cedar with the fragrant, natural aroma of vetiver, with a hint of patchouli to add complex spice and musk to the bouquet. Derived from the stem of lemongrass, vetiver has a smooth, earthy and fresh aroma, reminiscent of a warm summer’s day spent in nature. We’ve poured natural vetiver extract into our 100% natural wax blend alongside mid notes of cedar, for a natural and fragrant scent that’s invigorating and soothing. To this blend comes patchouli essential oil extract, adding top notes of musk to the blend. Patchouli is a natural aphrodisiac, used for decades in perfumery for its evocative, warm and sweet fragrance. Added to vetiver and cedar, this floral extract helps to give our Black Magic candle its sultry and seductive edge, with notes of sweet musk helping you set the tone for a romantic and sophisticated evening. Seeking to balance the heady top notes of patchouli with the woody mid notes of vetiver and sandalwood, we added a twist of orange to the blend. This citrus zest serves to refine and intensify the fragrance, for an unforgettable scent infusion.